+ Universal App! iPad Support Added!! + New amazing view: Aerial Camera!! 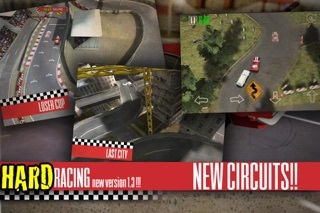 this game isn't called 'easy racing', it's 'HARD Racing', baby… don't be a loser and play only one lap….if you cant!!! #1 RACING UK STORE NOV'11!! 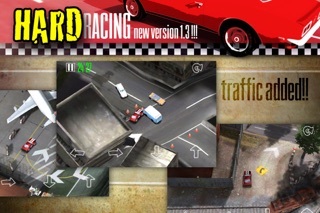 APPADVICE.COM: ".. is an exciting new iPhone racer made for “hard men only.” (However, after contacting the developer, I was assured that sissies and wusses can play the game, too, which means I am qualified to give the title a look.)" TOUCHARCADE FORUMS: "Overall I would say a great game from an indie dev working on his own, hopefully we'll see some updates to finesse the controls and add content. I am pretty happy with the purchase"
PERIODICO ElMUNDO: "Hard Racing: Así también se hace un videojuego"
Hard Racing is a top-down racer style with Stunning and photorealistic Graphics. Drive a classic Camaro in 7 circuits and 12 events. Three career mode: Rooki, Pro and Champion!. Drive to the edge and unlock each one: RAILROAD, AIRPORT, BAD NIGHT, THE ISLAND, CEMETERY, LAST CITY AND LOSER CUP! Compete against animated scenery: rocks falling,cranes, trains, airplanes, earthquakes, etc..
Hard Racing include 2 amazing night tracks. Be careful! Play in 3 amazing views: Classic Top-Down, Smooth Follow and Isometric View! You Choose!! A soundtrack that immerses you in the 70's. Funky fever! NEW UPDATE 1.3.1!! : iPad Support Added + New Aerial Camera View added! + 2 NEW CIRCUITS: LAST CITY & LOSER CUP! + New Career System: rookie, pro and champion. Win Medals to unblock new maps. 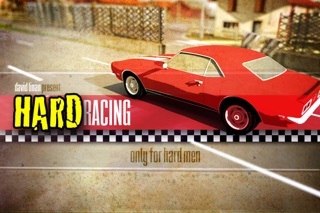 On the website you can download 3D Objects of Hard Racing absolutely free! !